When people are striving to achieve a healthier lifestyle they commonly have problems maintaining weight loss or gain. 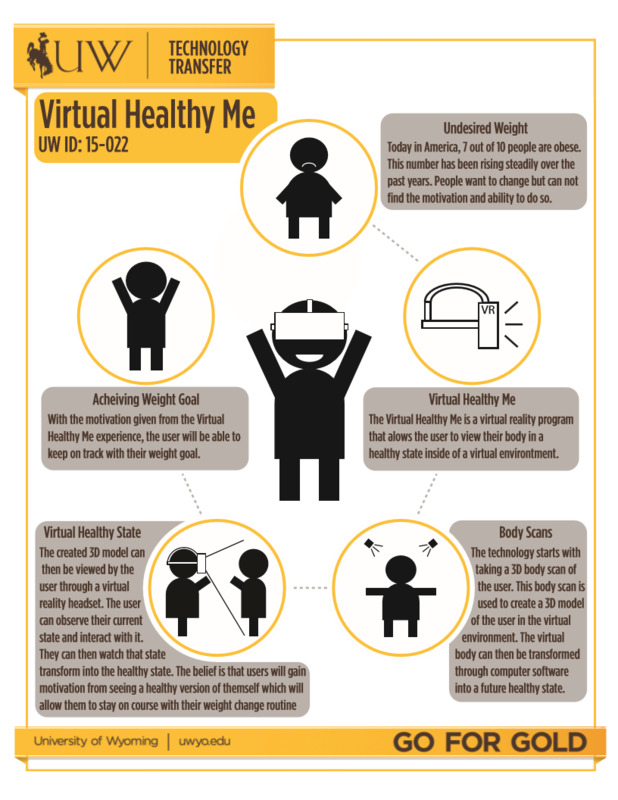 Researchers at the University of Wyoming have created an invention to allow a person to view their sustained weight loss or gain through a virtual reality software program. The device will allow people to experience themselves at a healthy weight, in a virtual environment. A set of 3D scanners can be used to create a virtual replica of the user. The user will wear a head mounted display, and be able to look around their virtual world and view its contents, including themselves. They first see themselves in their current unhealthy state, then the software transitions their body into that of their desirable weight. They can experience themselves in that ideal state, move their body around, and view it in its potential form. Using a combination of an Oculus Rift (head mounted display technology), a Kinect (a motion sensing input device) and Unity (a game engine and integrated development environment) the virtual reality experience provides the user with an easy and comfortable way to explore how they look a healthy weight. While wearing the Oculus Rift, the user can stand up, walk around a room, and look at their potentially healthier selves in a virtual mirror. The avatar or “altered self” might be able to impactt the user’s motivation and help them focus on a plan to getting to a healthy weight. Specific body parts and muscle groups could be targeted for focused work or therapy, and real results could be compared with the virtual avatar’s ideal goals. Other aspects of healthy movements, like proper stride or posture, could also be targeted for focused work or therapy. The avatar helps the user see the end result of their journey. The idea is that since they have virtually experienced themselves in a healthy state, they will be able to recall the experience when making eating and exercising choices. The software created and implemented using the Oculus Rift, the Kinect, and Unity, could be purchased by health care professionals providing a service to weight loss program participants, or by individual end-users themselves.